By now, you must have heard about the Google Chrome browser making headlines in the iOS ecosystem. Google announced the availability of its Chrome browser on iOS yesterday at the Google I/O conference. Since then, the app has been downloaded numerous times and has already reached the number one spot in the App Store. Google Chrome for iOS is certainly much better than the stock Safari browser on iOS, and I’m sure all of you agree. It’s fast, smooth, does more things, has more features and most importantly, syncs all your bookmarks and tabs from the desktop version. However, when launching web pages from third party apps, iOS will only let you choose Safari. Hence, here’s a new tweak from Ryan Petrich, that will let you choose Google Chrome and also help you set it as the default browser in iOS. 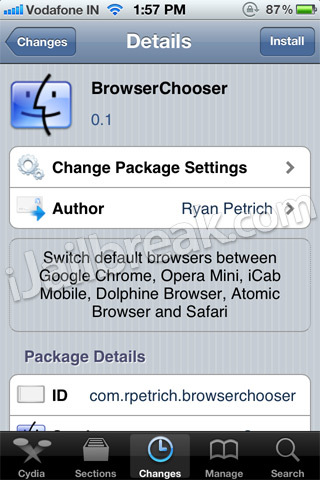 BrowserChooser is a new Cydia tweak from Ryan Petrich, that makes Google Chrome the default browser in iOS. When you click on any link now, it’ll open in the Chrome browser by default. To install this tweak, you will need to add Ryan Petrich’s repo to Cydia’s sources. To do that, go to Cydia>Manage>Sources and then tap on Edit followed by Add and enter this repo: rpetri.ch/repo. Once it’s done, you should be able to see BrowserChooser in Changes. Install the tweak, respring, then select Chrome as your default browser in Settings app. Done! External links may still say Open in Safari, but this tweak will force them to open in Chrome. It’s a complete solution and will make Chrome the default browser on iOS. So, how many of you are ready to ditch Safari and make Chrome your default browser on iOS? This tweak will certainly help, and yes it’s totally free. What do you love about Chrome? Let us know in the comments section below. What you don’t explain in that review is that there is an option to activate BrowserChooser but not select a default browser. What this does is allow you to select a browser via a menu whenever a link is about to be opened. Some links can only be viewed in Safari and so, this is how I have it setup on my iPad. How is te functionality different from browser changer (apart from the optional choose menu)?